I was mucking about in the Atomic Robo Timeline page, and kind of by accident I located a couple side stories at the Real Science Adventures site. The main Robo staff came up with the story ideas and gave them to random print artists. The results “vary by mileage,” but they’re still worth reading if you want to learn a bit about the Robo universe. The first book has Houdini, Tesla, Westinghouse and Annie Oakley, among others, thwarting a plot to overthrow the budding U.S. government. The second book describes how the She-Devils acquired their flying fortress base. MPSD and PE are short 4-page one-offs that don’t contribute much. And last there’s the first 11 pages of Project Millipede, the Agent Sparrow spin-off story that’s fully hosted on Atomic Robo.com. Again, the artwork is all over the place, and the characters in RSA especially are almost unrecognizable from chapter to chapter. The dialog for the Raid pirates is hokey to the extreme but it’s still a fun adventure. Check it out. Oh man. I was reading Greg Craven’s Hubris webcomic when the banner ad came up for Atomic Robo. Three days later, I surfaced for air after having finished wading through the archives. The artwork on the first half of the series is killer. The writing all the way through is just down-right hilarious, and I love everything about Robo. The later artwork isn’t bad, either, it’s just in a very different style. 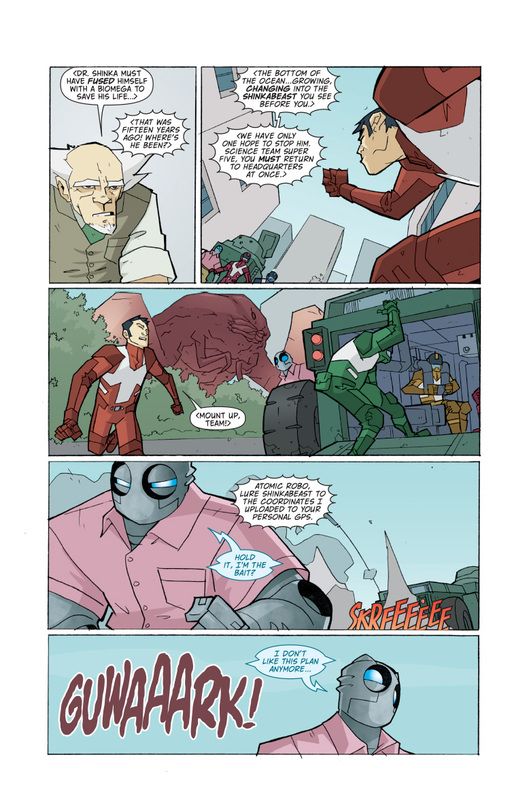 So, for anyone unfamiliar with it, (I know, I am very late to the party) what is Atomic Robo? Think of Doc Savage meets Buckaroo Banzai, but with more science guns and no guitars. Very, very funny stuff in a pulpy way. The website has links to the cover pages of the first 11 volumes, but not to volume 12, and not to the individual chapters, so I’m putting them here if you want them. Read this comic. Buy this comic. And Behold the superior dinosaur science of Lord Raptor!